I've tried to sit down and write this story many times for many months. I guess the timing was finally perfect today - as I see out the last of the year's energies. As with every year; the gifts of many lessons have come up for me during 2015. The difference this year, however, has been that I reconnected with my support network and they are walking with me right on into the next, and many more years to come. I've spoken before about the Medicine Wheel and my initial journey with the lessons of the Badger. 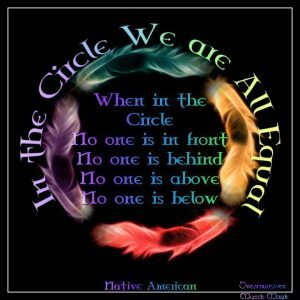 In brief; I am part of a circle who meet monthly to share and support each other whilst following the structured philosophy of the Native American Indian Medicine Wheel. Each month we intuitively select a stone from the Medicine Wheel and a supporting Animal Guide to 'walk with us'. We also share our reflections on the journey of the previous month. We are our own teachers and the learning, growth and support I've experienced has been phenomenal. ...The wheel is a circle divided by a cross to create four directions - the north, east, south, and west. A forerunner to astrology, each person is represented somewhere within that circle, depending upon their birth date. 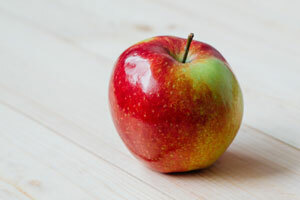 That placement is associated with a special moon, power animal, healing plant, colour and mineral. This year I reconnected with my Animal Spirit Guides - also known as Power Animals (Shamanism) and Animal Totems (Native American Indian teachings). I use the word 'reconnected' because we are of course moving through this life simply remembering that which our Souls already know on our journey back to wholeness. I include the word 'Chakra' because each Animal clearly resides - or resonates - with a specific Chakra for me - find out more about the body's Chakra system here. During a Past Life Regression session (March 2015) I found myself in a rainforest setting - I was in the form of a Lion (a magnificent creature that I've longed resonated with - the Lion typically represents me in my full power, my strength) and I was following on ground as an Eagle soared high above. As the Eagle approached a cliff edge I stopped and stood looking out over the precipice. The scene changed and I found myself (without form) in the presence of three Animals literally lined up in front of me - Ant stood alongside Spider who stood alongside Gorilla. As I explored the scene I explained to the session facilitator that the Ant was a Worker Ant - a black Ant; the Spider was a Redback and the Gorilla a Silverback. The facilitator, being a member of the Medicine Wheel circle, suggested that these were my Animal Guides - coming forward to support me. She asked the key question - the perfect question - 'Where do they reside within you? At which Chakra?' Instantly, I knew the answer - Ant was at my Base - my grounding, support, infinite strength, holding me up; Spider was at my Sacral yet I couldn't place why - there was work to be done here; and Gorilla was at my Solar Plexus - which surprised me - him being so strong - my Chakra of personal power. I don't know why I expected this Chakra to be weaker but I did, and to feel Gorilla connect so clearly was a pleasant surprise. I went on to continue up the Chakras. When I tuned in to my Heart I knew that the Salmon swam there - ever circling a pure white light. Salmon is my birth totem and I had come to know him well after 'walking' with him repeatedly during my time with the Medicine Wheel. It made perfect sense to me that he should reside at my Heart. I felt such energy and movement here - the heart of my Soul Force. I moved up to my Throat but couldn't connect with any particular energy. The Throat has long been a 'trouble' area for me - many repeated blockages in this Chakra and the focus of many of my life's lessons. 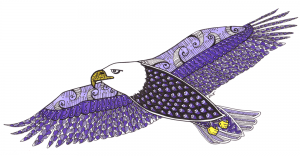 Moving on to the Third Eye, Eagle returned - yet he remained airborne - soaring high. I almost doubted that I resonated with Eagle - which I put down to a lack of self worth. The Crown was really interesting - I first saw a symbol - if you think of the Yin Yang symbol yet shaped like a droplet and without the small inner circles. This symbol represented wholeness, balance, alignment to me - the black representing the black of the night - where the Moon resides; and the white representing the light of the day - where the Sun resides. I saw two Wolves - a mated pair - balanced in their relationship. One was white (with blue eyes) and howled to the Sun; the other was black (with green eyes) and howled to the Moon. Each needs the other on this planet. I moved back to the Throat and sat for a while - a sense of fur or feather came forward - then bingo! - I got it - Badger!!! Of course it was Badger - Badger was the Animal I was 'walking' with as the current month's Medicine Wheel Animal Guide. I had come to the point of Badger representing my inner rage, anger, self expression - and had discussed my fears and blocks surrounding this with the facilitator before beginning the regression. Badger was the reason I was there - to reconnect - and I saw her as tamed and settled. This brought great comfort and I realised she was there for me - she 'had my back' so to speak. I began to spend time building a relationship with my Animal Spirit Guides - each morning I would wish them 'good morning' and acknowledge each one individually - I also thanked them for walking with me. 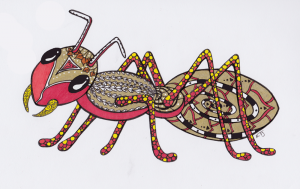 I always began by checking in with the Base Chakra - my grounding - instantly I could see whether Ant was busily at work or whether he was flagging. 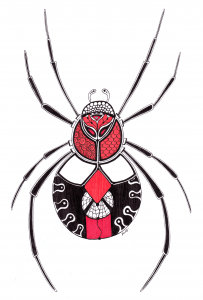 Working up, it usually took me a while to connect with Spider - although very quickly she gave me her name - Rowena - and it felt disrespectful to use anything other than her proper title - Rowena Redback. I still haven't quite grasped my lessons with Rowena - she always seems content but inactive on her web - waiting I guess. Gorilla has always been clear and strong - I have a real sense of his purpose - he's head of the pack and often I see him content with family life yet always the watchful and protective leader. He's pretty awesome and one of my favourite encounters was watching him play with the young ones. Salmon swims - so persistent and vital. Eagle seemed aloof at first - always soaring - and the Wolves are just so - a very different energy to the others - yet always unified - they pace a lot - circling - as though there is an anticipation. Badger I was weary of at first - there was a fear - a lack of understanding - surrounding how she represents my self-expression. I had assigned the characteristic of how Badger comes out snarling when backed into a corner and I wanted to deny this aspect of me. My journey with Badger has involved a dedication and courage to look into the shadow aspects of me - those parts which I'd perhaps like to deny exist - but they do - and that's ok. Walking with Badger has gifted my biggest lessons during 2015 and I know that there are more to come. A nice breakthrough moment with Badger came before my first Munay-Ki rites initiation in November - I went into meditation and realised that Badger was feminine energy and that she was in fact a mother - I saw her guarding her young. I connected with her on a whole new level which really helped - I realised that she behaves the way she does through fear and to fiercely protect. Given that she is of course an aspect of me, I took the young to perhaps represent my inner child - and don't we all react from this place?! Putting this together removed the fear and I've since focussed on simply loving the Badger. The reason I'm explaining all this is because one day my relationship with the Animal Spirits completely changed. I hurt my eye whilst gardening early April - bad enough for a trip to the emergency room. The injury completely debilitated me and left me on strong painkillers lay in the dark for days. The painkillers put me in a very drowsy state and seeing as I couldn't open my eyes anyway I decided to embrace the opportunity to meditate. I was frightened for my eyesight, in a great deal of pain and distressed at hearing how my husband and young daughter were getting on in the background (they're still working on understanding each other). I tuned into my Animal Spirit Guides - and as I did, what I saw took my breathe away! They were all gathered around me - very close and totally focussed on me. Gorilla held me up in his arms and a feeling of emotion came rushing in. It felt such an honour. I had only previously felt a separation with Eagle - a disconnection - and yet right there and then I realised that I am worthy. My support team were very present. This brought me such comfort and support and life has been very different since this point. I learnt that as I tuned in to each Animal Spirit I could gauge how the resonating Chakra was functioning. I also came to realise that there was no separation between the Animals and me. It became apparently clear that through the Animals I had a personification - a tangible identity - for my energy centres - for aspects of me. As well as gaining a support network I could identify with - which was massive for me - this journey has brought me great inner peace. I feel as though I know myself better - a return to wholeness. And I wish this for all. When you connect with your own inner peace - and I mean really experience how it feels so that you can recognise and return to that place - you become unwavering. I remember one of the very first holistic workshops I ever attended - EFT - I guess at 12 years ago. I clearly remember sobbing my heart out when I expressed how all I wanted in life was to achieve a sense of inner peace. It was the notion that summed up everything for me - happiness, joy, life. I can honestly say that I've connected with this feeling. It's hard to describe but it changed everything for me. I became less reactive, life became one constant state of meditation, I became more aware of - and felt more connected - to the little things - to all. I can more easily and quickly tell when I'm out of whack - and I know just what I need to do to recenter. Walking with my Animal Spirit Chakra Guides has gifted me this.. and more. Early on I knew that I needed to actualise the physical symbology and representation of my Animal Spirit Chakra Guides. Each drawing helped me understand the Animal a little more. When I connect to them in meditation I see them as real life Animals in their natural habitat. 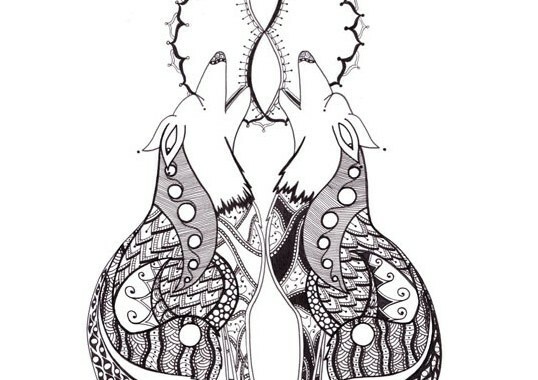 The drawings gave me a representation of their energies as they resonated with me. As I began drawing my Animal Guides it became clear that the purpose was in the journey. It was impossible to complete a drawing in the one sitting. The whole point of creating them was that I spent time getting to know them and meditating on their energies. They came into existence as whole pieces - I would work around and around gradually building up the whole image rather than starting at one point and working linear towards another. This method of working very much follows the art form of Zentangle® which is why it felt natural to pattern them that way - as ZIA pieces. When one stage of a drawing was complete, the next would be revealed in perfect timing. 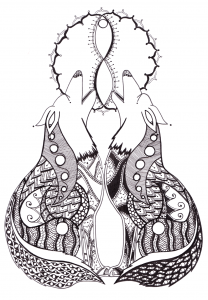 Find out more about Zentangle and my Zentangle and Doodle Art Workshops. Whilst working on these drawings, I also switched the focus of my art to Wild Animals in general - view artwork. I see the Ant as dedicated, unique and so so steady. He's hard working and never to be under-estimated. Colours of red and gold resonating with the Base Chakra and Earth energies - moving to orange and yellow of the lower Chakras. The triangle on his forehead is a portal and symbolises creation and strength. The spiral on his abdomen is the key feature of this fellow - symbolising the journey of life. This is Rowena Redback and I just love how she turned out! I included a web on her abdomen and glands feature heavily also. Orange resonates with the Sacral and I included a little red to ground also. Rowena is complicated, feminine, clean cut - not too fussy at all - strong and bold. She connects with passion - for human and animal rights. I have a sense there is a past life lesson with her. This guy took the longest time to actively create - it was important to get his eyes and facial expression right. I also spent quite some time meditating on how he should look overall. He came out quite tribal - I see the black swirling patterns as tattoos and his arms and legs are protected by decorative armour plates. 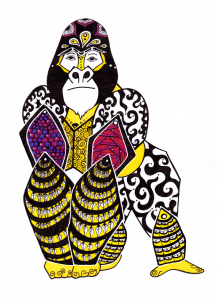 He bears yellow which resonates with the Solar Plexus although also plates of purple for wisdom and red for strength - Gorilla is the balance between the two. His soft underbelly is the main yellow area representing the soft abdomen of the Solar Plexus and also how the big strong Gorilla still has a soft centre. 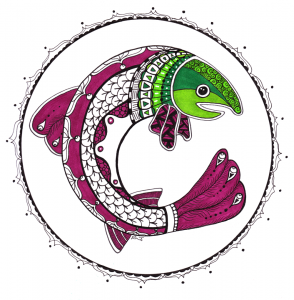 I knew that the Salmon needed to be in either pink or green to resonate with the Heart Chakra yet it was initially jarring with me as I had an image of a silver Salmon in my head. I knew very quickly that Salmon needed to be depicted within a mandala (circle) to represent the Heart and wholeness - but the image of the Salmon itself took some time before I could begin. The breakthrough came when I was researching the form of Salmon and I came across the Sockeye - this guy is quite fascinating to behold - silver whilst at sea then turning the brightest pigments of red/deep pink and green as they return to the river to spawn. The males have a distinctive hump on their back and a more pronounced hooked top jaw. I've depicted a female - she is insightful, persistent and dedicated - a mother of all. Badger was the first I drew and I think that shows - I hadn't quite found my way yet. I saw her as laying in wait - peaceful aggressive with past life links. Blue to resonate with the Throat chakra. Badger has a kind of crown - a regality. The eyes were also key although I still haven't quite placed their significance - almost as though she is sleeping yet still sees. Badger has quite an ornamental head yet a soft, fluffy body. She almost reminds me of a Lion. Eagle took the longest to be revealed to me. It was important not to rush her and I spent hours just sat looking at her trying to decipher the next step. Her patterns were key - and the wings particularly significant. This all made perfect sense with Eagle resonating at the Third Eye Chakra - intuition, spirituality - it was important for me to journey with her and get out of the head - to trust. I also stalled on colour for a while - purple I knew to resonate with the Third Eye although the artist in me wanted to pair this with another colour but I knew it just wasn't right for her. I spent some time testing pens with only the very slightest of variation in colour to get the right ones. Eagle's eye gives her a Native American totem feel. She's strong and sure of herself. These are my twin Wolves - a mated male and female. I had a very clear vision of how these guys should look - my only stumbling block was how to represent the moon and sun. I really wanted to block out the moon half in solid black but I just couldn't find a pattern to make this work and it felt important to keep the decorative borders of the sun/moon and double helix/infinity symbols. The Wolves represent balance - wholeness. One is black - the other white - and they are a reflection of each other - one cannot exist without the other - light must be balanced by dark. I have been working with the Medicine Wheel for 12 months now, each month working with the corresponding energies associated with a stone on the wheel and supported by the energies of a different Animal Spirit. March brings lessons of the Badger. 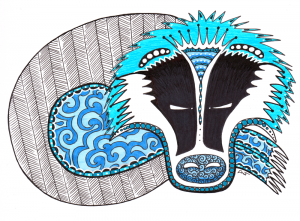 As I drew the Badger card I instantly felt a comfort – a familiarity which I thought came from my UK connections. 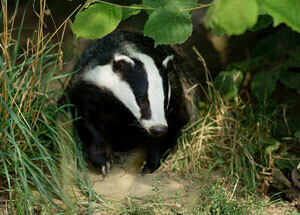 The Badger instantly brought back childhood memories of exploring Delamere Forest near my hometown in Cheshire. He felt warm and cuddly. Then as I read on the Animal Spirit of Badger, I knew this was going to be yet another big month of deep lessons and healing : my aim is to tame the Badger – which I now see as a representation of my inner rage. You must be persistent and stick with your project to its completion no matter what. Be willing to ferociously defend your beliefs and principles and meet any challenges or criticism head-on. It’s time to stop your delay and avoidance tactics and get on with what you know you need to do. Stop always depending on others then resenting them when they don’t come through, and trust that you have the capability to be self-reliant. Tune your anger and aggression into constructive action without cutting others to shreds. Dolphin also supports me this month : Gentle and non-verbal communication. I’ve had a contemplative time so far this month working with these awesome energies. I don’t know why, after 12 months, I’m still blown away every time I read up on the energies of a particular Animal Spirit after welcoming in its guidance and support : the clarity and comfort I’ve found from this journey continues to be completely awesome. In recent months I’ve also felt the breakthrough and advancement as I’ve really understood the lessons and done the supporting energetic work. 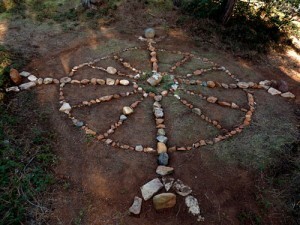 For the first time this month I’ve also researched deeper into the Medicine Wheel – it’s layout, symbolism, use etc. I knew I was a member of the Thunderbird Hawk family or clan – although admittedly, don’t yet fully understand what that means – and it was further confirming of the month ahead to see that Dolphin’s stone sits on the Thunderbird line. Slowly I’m piecing things together. I am so grateful to my teachers : for the space they create and hold, for the wisdom shared and to the Circle. Much more to come on this subject as I continue to walk The Medicine Wheel.